Fort Lauderdale provided the backdrop for one of the most closely contested Senior divisions in recent memory. Pool play was headlined by numerous close finishes, physical play, and challenges from each team, as every game was decided by 10 points or less. Although each team would qualify for the playoffs, no one wanted to give an inch anywhere along the line. Once the playoffs began, the games became all out battles. In the first Semifinal game, the Chicago Dragons, led by Henry Yue and Alex Wong, would face the New Jersey Pirates and NACBA Top 25’er Beaver Ho. Chicago came out hitting some big triples, as Dave Chen and Fu Yue nailed some big ones to give Chicago an early lead. 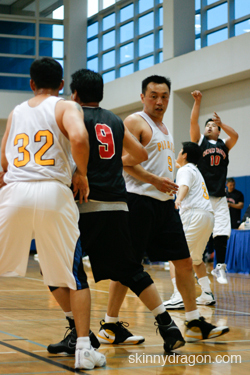 Steve Lee (All-Tournament, 11 pts) kept the Pirates in it, as he was producing at both ends. In the second half, NJ’s perimeter defense tightened it up and PG Ted Hom shouldered more responsibility to put the ball into the hoop, dropping in 7 second half points. NJ waged an intense come from behind win 34-33. The other Semifinal was the winless Boston Knights Seniors meeting the two-time defending champion Toronto CCYAA Seniors. During pool play, these teams had put on a pretty high scoring show, as CCYAA had emerged victorious 64-55. In the playoffs, things got a little bit more deliberate. This seemed to work in Boston’s favor at the outset, as they were able to spread the ball and take advantage of greater team speed. With 9-man volleyball legends Kin Yun (8 pts), Samson Lee (2 triples, 3 fouls), and Rich Szeto (7 pts, 5 rebounds) on the mark, Boston was looking good. 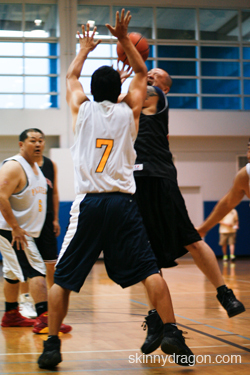 For Toronto, it was none other than Richard Zhu (14 pts, 8-8 ft) who was keeping the game close. Boston took a 2-point lead into the halftime break, and was looking to keep up their surprising run. In the second half, Boston PG Walter Ho dropped in 12 points on a mix of deep treys, drives, and jumpers to give his team a chance. But then Zhu’s perimeter teammates decided to make some shots, as Stan Ong had 13 points in the second half, and teammate Robert Choy (6 pts) displayed why CCYAA made the right choice in acquiring him from the Chicago Dragons as he sank 2 huge free throws in the nick of time. CCYAA moved forward 40-35. The Championship game pitted the 2 teams that most had predicted would meet up in the big game. Toronto CCYAA knew that the Pirates were coming hard this year, and they knew that they would need a big time scorer to combat the quicker and more athletic Jersey guys. The usual Toronto contingent of David Kuo, Stan Ong, Jeff Fong, and multitime MVP Richard Zhu would need a little more umph if they were going to take home another chip. Toronto persuaded NACBA Top 25 pick Robert Choy to leave his longtime Chicago Dragons teammates with the promise of greener pastures. The Pirates would feature a balanced attack, with the steady backcourt play of Ted Hom and Min Pham, coupled with the excellent but frontcourt play of Steve Lee, Hak Lee, and Rich Lo. And of course, New Jersey would always have the necessary star power that living legend Beaver Ho provides. The only thing that could hurt NJ’s chances was the absence of 6-4 post player Osman Hsieh. But on paper, this looked like it had the makings of something special. The game started with Toronto establishing the dominance of Zhu (15 pts, 4-4 ft, 1 triple). It became clear that the absence of Osman Hsieh was going to be a big hurt for the Pirates, as Zhu was simply a beast when he wanted to be. New Jersey realized that they would have to start focusing on stopping Richard. That would mean Toronto’s other 4 guys would start to get uncontested shots as the mind bogglingly unselfish Zhu would use his size and court vision to spot the open teammate. The CCYAA supporting cast got their flow going, as Robert Choy (All-Tourney, 10 pts, 4-4 ft) and Stanley Ong (16 pts, 3-3 ft) made it a pick your poison choice for NJ. Toronto seized control, taking a 10 point lead by halftime. In the second half, NJ’s Beaver Ho (9 pts, 1 treyball) and Teddy Hom (10 pts, 5 assists) picked up the tempo as the Pirates tried to make a run. But the deficit proved to be too much to overcome, and Toronto would sink 10 of 12 freebies to win the game 51-35. Toronto has now championed 5 of the last 6 Senior titles and looks to take another on their home turf next year. New Jersey Pirates def. Chicago Dragons Sr.